Minority Rights Group International (MRG) has today launched a new multi-media report exploring gender and sexual dissidence and diversity in Spain’s Gypsy community. Based on interviews during Madrid Pride week in June 2018, It’s here! Romani sexual dissidence provides insight into the realities of living with a multilayered identity in Spain that includes being a Gypsy and a member of the LGBT+ community. 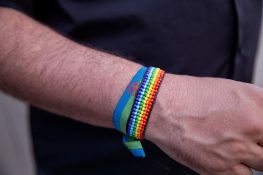 Many LGBT+ Gypsies in Spain shun the mainstream Pride celebration because of what they perceive as its commercialisation and exclusion of marginalised groups, such as ethnic minorities. Through first-hand interviews, the report highlights how the realities of LGBT+ Gypsies intersect with other axes of oppression, such as class, ethnicity and poverty or physical traits and characteristics. It’s here! Romani sexual dissidence is an online collection of articles, interviews and photo-stories. It includes an introduction explaining the history of Gypsy identity, a photo-story focusing on musician and community role model La Negri, and a first-hand account on what it is like to be a Gypsy sexual dissident in Spain. The report is part of a series developed by MRG called Minority Stories, which uses text, photographs and video clips to explore the realities confronting minorities and indigenous peoples today, most especially those groups within these communities which face intersectional discrimination. Access the report ‘It’s here! Romani sexual dissidence’ here. Text and photos by Emma Eastwood and Bex Wade. Ververipen is a Spanish Gypsy collective promoting the concept of diversity and sexual dissidence in their community. Fakali is the Federation of Gypsy Women Associations, based in Andalucía, southern Spain. Plataforma Khetane is a platform of Gypsy organisations at a national level in Spain. Is integration “impossible” for Roma in France?